STATEN ISLAND, N.Y. -- John Sublett hosted a "Toys 4 Autism" toy drive over the weekend at PS 37, the same Great Kills school his son attended as a child when he was diagnosed with autism. All toys collected, with the help of John. Jr., were donated to the school. 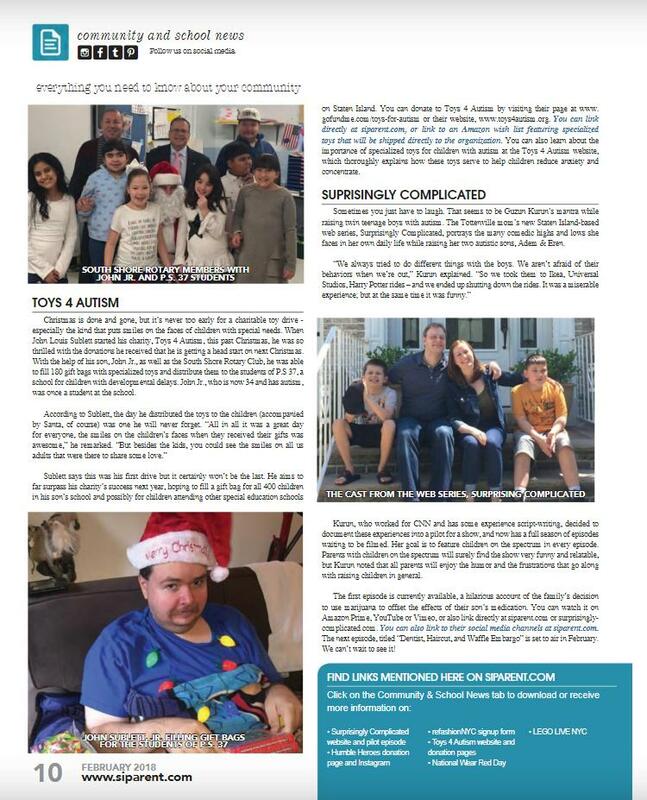 "I posted on my Facebook page called 'Old Staten Island' that I was running a toy drive for special needs children on Staten Island," said John Sr. "I named my toy drive 'Toys 4 Autism' and I set up a wish list on Amazon and selected special toys that were good for children with ADD, Autism and ADHD. And before I knew it my mail was flooded with gifts for these children." In total, the father-son duo (John Jr. is now 34) collected 180 small gift bags with each bag containing three small toys, a candy cane, a blow pop and a chocolate marshmallow candy bar. "South Shore Rotarian Jon Salmon saw what I was doing and led me to a fellow Rotarian, Frank Cilento, who has been giving out chocolate Santas and candy canes to many special ed schools around the Island; and one of the schools was PS 37," John Sr. said. "This was a perfect fit for me. He talked to principal Florence Korsky of PS 37, and it was all set up. On the snowy morning of Thursday, Dec. 14, I met up with three gentlemen from The South Shore Rotary at PS 37." The day kicked off with a holiday musical show presented by students followed by a roaming Santa who helped distribute the presents to each classroom. "I was amazed at how well structured each classroom was and how well equipped medically the school was," John Sr. said. "The staff was friendly and caring and all in all it was a great day for everyone -- with great smiles on children's faces when they received their gifts. But besides the kids, you could see the smiles on all adults who were there to share some love." John said "Toys 4 Autism" was his first drive, but it won't be the last, "thanks to Frank Cilento from the South Shore Rotary, who took the time to coordinate what I was doing with the principal of PS 37. I look forward to working with Frank and The South Shore Rotary in many future ventures." The Sublett family also extended kudos to others who helped ensure the day's success: Leslie Stevens, Pat Donahue, Christine LaRocca, Rosalie Pantano, Sal Nicolosi, Mary Alfano, Maryann Otto Petti, Derek McAfee, Ida Zakin, Laura Reeves, Marguerite Maria Rivas, Thomas Metzger, Julisa Herrera, Kathy Galloway Shunkwiler, Elizabeth Alster, Debbie O'Shea, Carol Ann and Ralph Esposito, Loraine M. Kriegel, Tricia Danielsen, Valerie Baldini Sublett, Liz Rowland French, April Schifano, Vic Vitale, Dnna Nicholson, Judi Bartolomeo, Vivian Nicolosi Trapani, Kari Kay, Andrew Buchholz, Christopher LoCicdero, Vito and Lauren DiMaio, Susan Brennan Gaglione, Anita Salek, Kelly MacStoker Marshall, Anita Aasen and Diane Ruddock.